January 27, 2016 by Matthew Rossi. Security systems are jumping aboard the technology train. Therefore, configuring these systems are starting to get more difficult. Keeping your IP camera system safe from accidental or malicious misconfiguration might seem like a large headache. There are a few layers of protection you can take to make sure no one can access something they aren’t supposed to. The last thing you want after installing your system is to have it ravaged by someone on the back-end rendering it useless. 4. Change the password for admin to a unique password that is no more than 6 characters long. Do not forget this password, as resetting the camera may require sending it back to our RMA department for a reset. The next step to take is to set User Groups to assign different roles to different Users you may want to have. This way you can limit certain Users to specific functions. 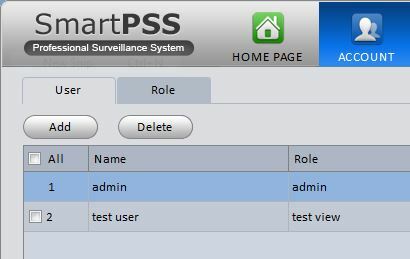 These Users will then be connected to the DVR or NVR with their username and password when using SmartPSS. Each User will only be able to access the content allowed by the settings configured in the NVR/DVR for that User and its Group. 1. Using IE11 navigate to the IP address of your NVR/DVR and log in as the administrator. The default is admin/admin. 2. Select the “Setup” tab at the top of the screen. 4. Select “Modify” on the admin account then check the “Modify Password” box. 5. 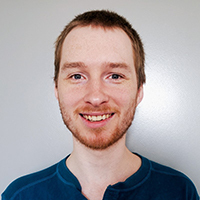 Change your admin password to a six character string. Completing this will help prevent unauthorized people from accessing your NVR/DVR. Now create a new user by selecting add user at the bottom. 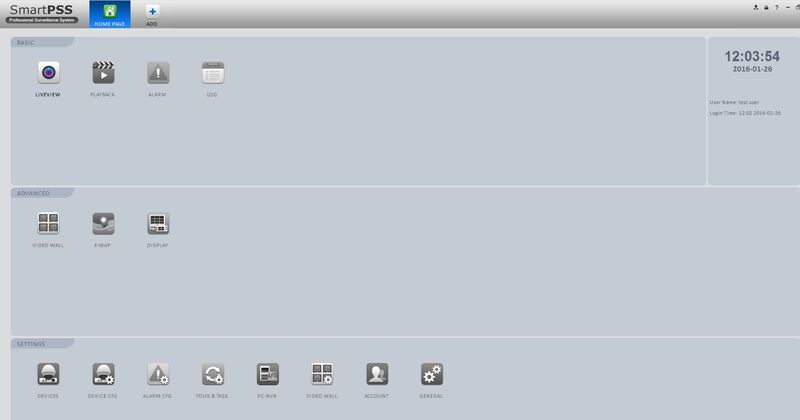 These users will be generic rights templates for the users that will have access to monitor, playback, record etc on the recorder. 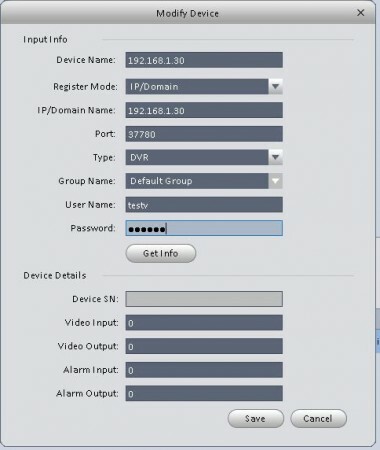 After you have your User and Groups created on the NVR/DVR, you will be able to set up SmartPSS easily. 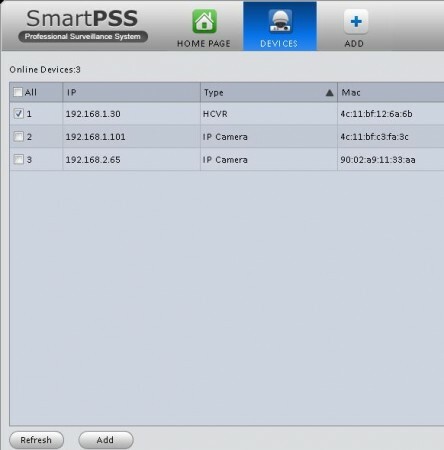 You can also create accounts in SmartPSS to limit user access on the local machine to only certain functions on SmartPSS so they are not able to scan your network for IP cameras and NVRs using SmartPSS's built-in network search feature. In a given scenario if one machine views live footage and another machine reviews stored footage, you would create an account on the viewing machine and apply the role when setting up the software. The same will go for the second machine, only with the separate role you created. 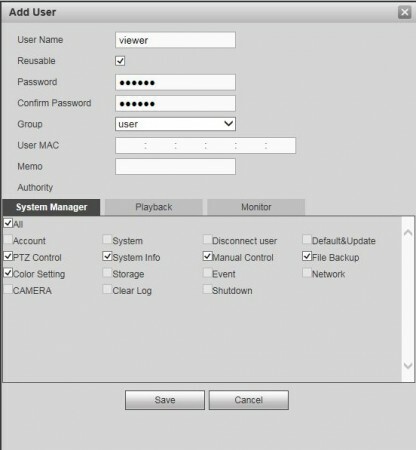 Before you create user groups on SmartPSS add your NVR/DVR using the admin account. 1. Go to on the bottom left of the home screen. 2. 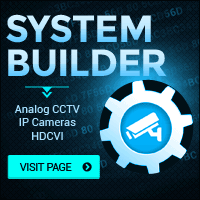 Select the NVR/DVR you’d like to view and click “add” below it. 3. Double-click the device you just added in the lower panel. 4. Change the username and password to the proper User/Password that you created on the NVR. 1. Click on at the bottom of the screen. 2. Create “roles” for your new user groups by selecting the role tab at the top left. 3. 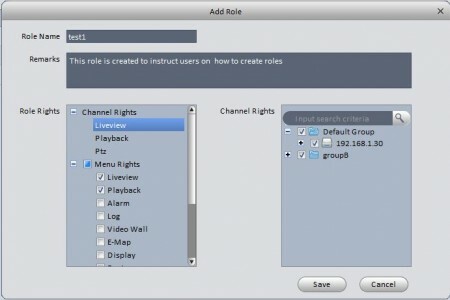 Add a role by naming it, adding any remarks, select channel Rights, and menu rights. • Repeat step 3 for as many roles as you need. 4. Create your users by selecting USER > [add], Name the user, give the user a password, select a role from the drop-down box, customize the specific users role by removing permissions as needed from the rights. 5. In our example, after logging in with “test user” given the rights granted, the only available option to access is Liveview. After completing these tasks you will have added up to three layers of security to your system, and you are ready to start monitoring. Tagged in Network Security, SmartPSS.